I was working on my best-selling book this morning, Practical Font Design, Third Edition. It’s an ePUB with 266 graphics in it—almost entirely screen captures—showing what I am doing in FontLab as I design a font. I realize that’s anathema to many of you code geeks, but the ePUBs out of InDesign are now more than good enough—if you design within its limitations. Now that I have my iPad and read a lot of ebooks, I have changed my mind a lot about what is necessary for ebook design. Would I rather have a printed book with excellent typography? Of course! I buy them if those things are available. But I find that most books are not well designed typographically in the first place. Often the printed designs are so hard to read that I simply quit reading. When are book designers going to learn that ghosted images mean illegible type? AND: I can no longer afford printed books in many cases. With the cost of printed books well north of $20, I’d much rather have an ebook at $10 or less. If I can’t find that, I’ll wait until I can get a good used copy from Amazon for under $10 [including the shipping]. I’m making a new revision, resizing all my graphics to 600 pixels wide or 700 pixels tall, and fixing typos. This is a common thing for me as a small publisher without the resources (or the niche size) of the big boys. I’m working on an edition to upload to Kobo’s Writing Life and they require the upload to be less than 10 MB. For Practical Font Design the PDFs were always about 14 MB and the ePUBs were 13 MB or so. So, I resized all the graphics to fit the 600×800 pixel limitations of an ePUB or KF8 page. I exported the ePUB, and it was still 13.9 MB. As a result, there are two things I have learned to do. I have found that Save for Web in Photoshop to a JPEG helps me a lot in file size for all the larger graphics I use in my software training books. This is especially true for KF8 where you need to keep your file sizes for your graphics under 127K. The problem was that Save For Web didn’t help all that much because I had made several of the graphics over up to 600 pixels wide [instead of smaller, harder to read sizes]—plus I had to add several graphics to cover typography (like things requiring specific fonts or OpenType features). So, even after Save For Web in Photoshop, I was still at 13 MB. But while I was exporting the ePUB I noticed that InDesign was doing a LOT of writing of graphics. That should not be as I had the graphics sized and optimized the way I wanted them to be. 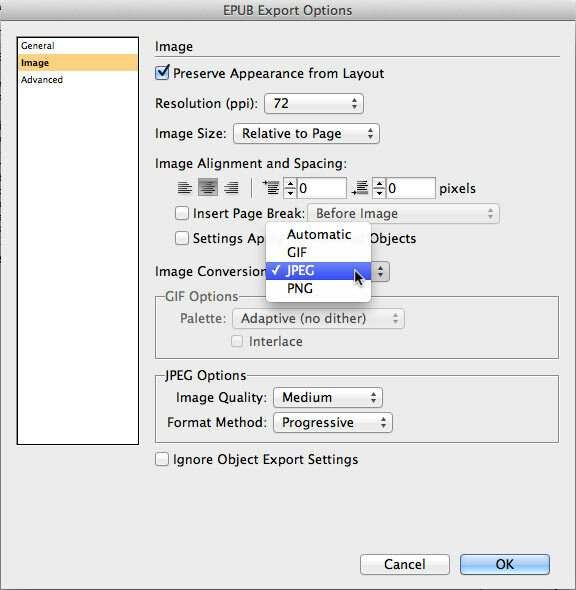 In particular, I noticed InDesign was writing a lot of PNGs. Where the heck were they coming from? So I changed the Image Conversion: setting from Automatic to JPEG. Now when I exported the ePUB, the file size dropped to 7.2MB. That simple change saved me 6 MB! If I changed the JPEG Image Quality to High, then InDesign did a lot of writing again and the file size jumped to 10.9. But with Medium quality, InDesign didn’t write any graphics at all and the file size dropped 6 MB. That made me very happy. I just set them at Palatino and Helvetica Neue. I find that combination works the best in iBooks for my extensive use of run-ins and inline character styles. All the other serif/sans combos have far too large a variance in x-heights. Now, all I have to do is make a copy using Contenu and Buddy embedded for KF8. They are the fonts I designed for book use and the KF8 books look really good in Fire. It’s a real pain that Amazon will not upgrade their iPad Kindle app [which is where I actually read all my Kindle books], but the proprietary wars roll on. Thank you, kind sir. I haven’t messed around with InDesign’s export option too much, but I have heard that it can cause heartache for image conversions. Thanks for providing a good workaround. Occasionally I use photoscape, because it can do batch processing. I find that a 70% quality setting is usually fine for eBooks and it gets those image sizes really small (less than 30K, typically). Also, if you want to really geek out, you can write a program in your favorite scripting language to do this. I had an eBook with over 700 images, so writing a simple program actually saved me time in this endeavor. It sounds like a good solution. However, I am deeply suspicious of automated solutions. They only work with average images—as if such a thing actually existed. So I take the time to do it by hand, but then I have that luxury. I can remember when that amount of time was simply not available.